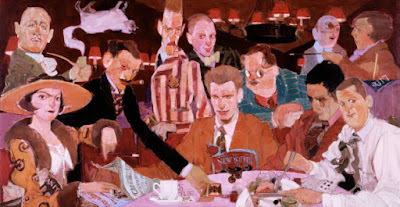 Natalie Ascencios' "A Vicious Circle" features many of the key players in the what has been dubbed the Algonquin Round Table. In this illustration you will find: Robert Benchley, Franklin Pierce Adams, Robert Sherwood, Harpo Marx, Alexander Woollcott, Marc Connelly, Edna Ferber, (seated) Dorothy Parker, Harold Ross, George S. Kaufman, Heywood Broun. This lively group, supplemented by the likes of Tallulah Bankhead, Alice Duer Miller, and Donald Ogden Stewart, held court from 1919 to 1929 at Algonquin Hotel. 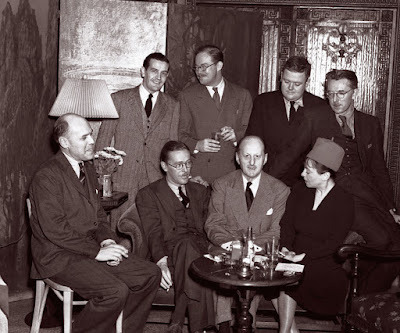 They began meeting after John Peter Toohey, a theatrical agent, became angry at Alexander Woollcott for refusing to write about Eugene O'Neill, one of Toohey's clients. Toohey decided to invite Woollcott to lunch as a "thank you" while secretly planning on having Woollcott made fun of. Of course, Woollcott loved it and began regular lunch meetings that became daily events. The food came in from Frank Case. Case managed the Algonquin, buying it in 1927. It is Case who is credited with the first "round" table. In the beginning, the group dined in what would become known as the Oak Room and they were seated at conventional tables as if they were any diners. As the group grew, the rectangle table became increasingly cumbersome and the the group was moved to the Rose Room where Case installed a round table. "Highly spiced dishes happen to be my particular weakness and, at the same time, on my dietary taboo list. 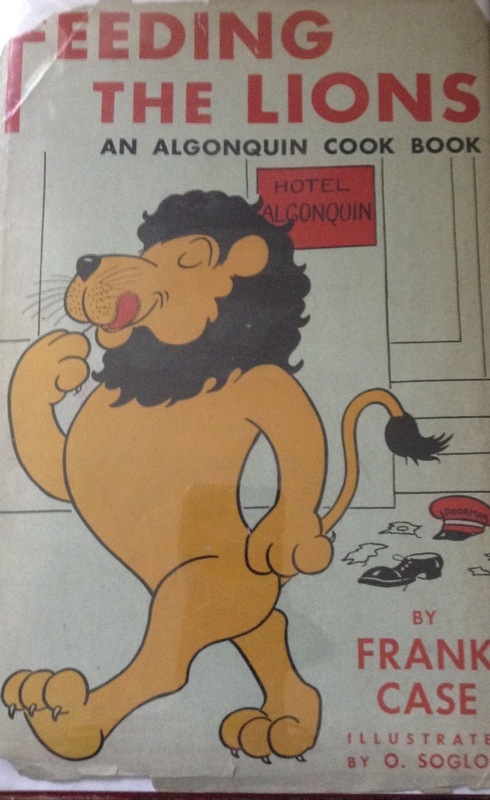 I manage to be stern with myself, except on those occasions when I lunch at the Algonquin. After looking at all the dishes that I might and should order,I take those curried shrimps with rice that the Algonquin chef does so tantalizingly." Prepare 3 cups rich cream sauce, using half cream and half milk. Boil the raw shrimp in salted water for 5 minutes and allow them to cool. Peel and remove the dark intestinal tract. Saute them for 5 minutes in 2 tablespoons butter, add the curry powder and the wine and simmer for 5 minutes. Add to the cream sauce, mix thoroughly and cook for 5 minutes. Serve with rice pilaf and chutney. Grated fresh coconut and chopped toasted almonds are traditional accompaniments. In 1987, Aviva Slesin won the Academy Award for Best Documentary for The Ten-Year Lunch: The Wit and Legend of the Algonquin Round Table. Unfortunately, it has been out of print for years, but recently turned up on YouTube. The Alan Ruldoph film, Mrs. Parker and the Vicious Circle is a pretty good fictional depiction of the era, and an excellent look at the evolving "round" table of Frank Case. In 1998, The Algonquin received a much needed face-lift and the Rose Room was eliminated. In 2005 the Algonquin produced a new menu incorporating many of the favorites in Frank Case's cookbook. In this day and age one might ponder if the round table seated a truly vicious circle. Groucho Marx, brother of regular Harpo, was never comfortable with the luncheon regulars. A quick wit who possessed his own biting repartee, Groucho Marx said of the Round Table, "The price of admission is a serpent's tongue and a half-concealed stiletto." Thanx so much for this - it was a real treat.